Rejected acoustic tracks, Adrian Smith writing the band's singles and a tour with faltering inflatables and yards of spandex, what was going on with Iron Maiden and Somewhere In Time? The success of the World Slavery tour, not to mention the subsequent release and chart-battering triumph of the classic Live After Death live album in 1985, meant that Iron Maiden were now in more demand than ever and that all eyes and ears were keenly primed to receive the band’s next creative outpouring. Given that several years of non-stop recording and touring had driven them – and Bruce in particular – to the brink of exhaustion, that kind of immense external pressure could easily have compelled a lesser band to take an extended hiatus or, at the very least, a brief pause. But Maiden were stopping for no one. After Bruce’s plans to take Maiden in a radical new direction were brusquely rejected by his band mates, the singer stepped temporarily aside, allowing other members of the band to take up the compositional slack. On this occasion, it was guitarist Adrian Smith who grasped the nettle, contributing three songs to the sixth Maiden album, Somewhere In Time, including its first single, the anthemic Wasted Years. With Steve conjuring up his usual flurry of epic songs, the new record was destined to be another grand and substantial statement. Recorded both at Compass Point Studios in Nassau and at the legendary Wisseloord studio in Holland, Somewhere In Time did mark a slight departure for Maiden, in that it featured the use of the then distinctly groundbreaking guitar synthesizer, something that had seldom been a feature in metal prior to that point. Adrian Smith’s songs certainly brought a fresh vibe and an air of radio-friendly oomph to the album too, perfectly complementing Steve’s compositions like instant live favourite Heaven Can Wait and the grandiose Alexander The Great. It may have been the most controversial Maiden album to date, but Somewhere In Time, with its magnificently inspired and detailed Derek Riggs artwork featuring Eddie in full-on cyborg mode, would go on to delight the diehard fanbase, ensuring that the band’s momentum was in no way diminished by a slight change in musical mood. Released in September 1986, Somewhere In Time was another great success for Maiden on both sides of the Atlantic. Despite having come close to collective collapse at the end of the World Slavery tour, there was no way that Steve Harris or Rod Smallwood were going to allow the band to take their foot off the gas, and so they immediately embarked on another colossal world tour to support the new album. Kicking off with a 24-date UK run that concluded with six consecutive sold-out shows at the Hammersmith Odeon in London, the Somewhere In Time tour took Maiden to a new level of presentational audacity. 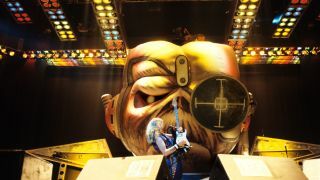 The science fiction vibe of the album’s iconic cover art provided a perfect spring board for the band’s imagination to run riot, resulting in a stage show that was visually explosive and unapologetically extravagant, in keeping with Maiden’s now steel-plated reputation as the greatest live rock band on Earth. With hindsight, however, the tour also marked the point where the band’s penchant for the spectacular dragged them firmly into the realms of the ridiculous. Bruce, "We had two big hydraulic hands, which would raise up – not Spinal Tap at all!" Never a man to hold back from injecting some theatrical flair into Maiden performances, Bruce was in his element during the _Somewhere O_n Tour, arriving onstage adorned with some of the most bizarre and elaborate costumes imaginable. Maiden chose not to have any of the gigs on the tour professionally filmed, but despite that unfortunate oversight it’s safe to say that anyone who saw the band at that time will have the image of Bruce’s stage gear, not to mention his bandmates’ increasingly flamboyant variations on a Spandex theme, permanently etched onto their memory. Malfunctioning inflatables and ludicrous clobber aside, the Somewhere In Time tour was another unequivocal triumph for Maiden. Not only were they now enjoying unprecedented levels of popularity in both Europe and America, but even the Far East had succumbed to their charms – a phenomenon that led to the band headlining at Japan’s legendary Budokan venue for the first time.